4 Territory Management With, assignment rules automatically route leads to the relevant sales representatives based on territories. It is possible to reate new teams and re-assign ownership of teams as well as view marketing campaigns, response rates and associated sales revenue by territory. provides sales executives with a complete diary solution allowing the sales team to effectively keep track of client visits, pipeline meetings and routine tasks. Sales Process Automation In, the sales process is automated to enable users to concentrate on their primary purpose which is selling. The in-built workflow can be followed out-of-the box or customised to reflect your business process. The automation in means that all sales users follow the same steps, ensuring no opportunities fall through the cracks. The sales process can be structured to suit your internal business process for maximum effectiveness. also delivers periodic messages to sales managers summarising critical opportunity and forecast information for their direct reports. This ensures business opportunities are always retained and worked on. Communications Management provides sales users with a complete diary solution with daily, weekly, monthly and yearly views. In addition, onscreen reminders and notification alerts are available to all sales team members increasing efficiency, punctuality and convenience. delivers a seamless calendar management experience thanks to real-time synchronisation between and MS Exchange. This enables mobile users to access up-to-date appointments, tasks and contacts within on their smartphone, laptop or desktop PC for maximum ease-of-use and productivity. ERP Integration With and ERP integration, sales executives have access to customer data from the back-office allowing a true single view of the customer. This ensures that the sales executive is equipped with the most accurate and up-to-date information regardless of where that information is located. Operations are optimised as a result and there is less potential for delay, misunderstanding and error. 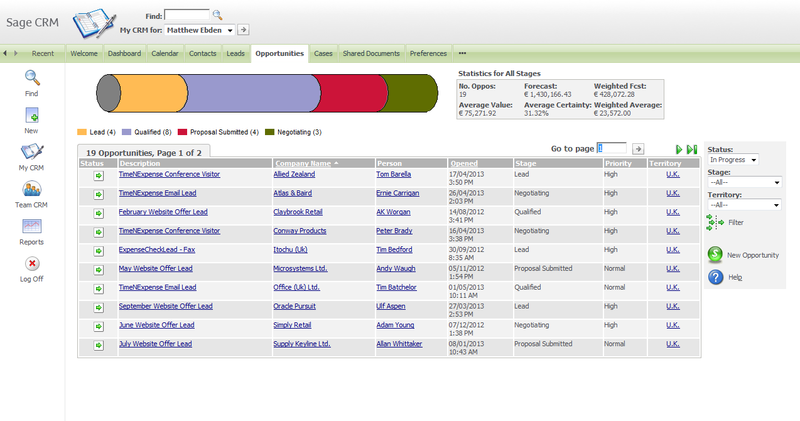 Information from the Sage ERP system can be displayed directly on the interactive dashboard for quick and easy access. For example, sales staff can easily check the availability of stock across different locations and can check the real-time status of orders without having to rely on multiple, disparate systems or consulting colleagues who may not be available. This enables sales staff to give accurate information to customers without delays, and thereby improving customer service and driving customer loyalty. Anytime, Anywhere Workforce enables mobile sales teams access their important customer information from the latest mobile devices. Additionally, s native apps for the iphone and Windows 8 devices provide mobile sales teams with real-time data to help them manage their business relationships wherever they are, even when out of coverage. This synchronisation of information fosters organisational transparency within the business and enhances the quality and retention of information available to the user. 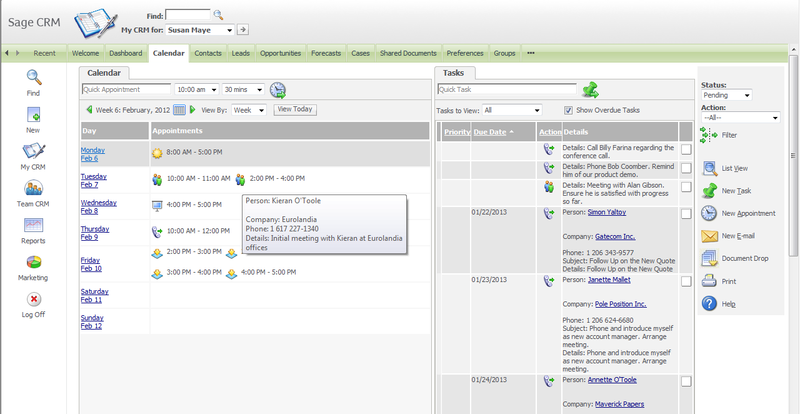 The calendar can be managed from the interactive dashboard ensuring that appointments and tasks are managed with ease. equips the sales team with mobile access providing them with critical customer information while they are on the move. 6 About is used by over 12,000 organisations in 70 countries worldwide to manage their critical sales, marketing and customer service activities every day. Award-winning equips businesses with the tools they need to find new customers, close sales faster and build lasting, more profitable relationships across all channels. Regardless of how, when or where customers, partners and prospects choose to interact with your business, Sage CRM provides a decisive advantage by delivering a comprehensive, easy-to-use system to successfully manage these relationships. Thanks to its ERP integration capabilities, the front-office is powered by data from the back-office to give sales, marketing, customer service and other front-office staff a true 360 degree view of customers across front- and back-office functions, differentiating it from many other CRM solutions in the market today. See for yourself the difference that could make to your business. Visit and start your free 30 day trial of now. Get social with and stay up to date 2013 Sage Group Plc. Sage CRM Communicate, Collaborate, Compete with Sage CRM CRM - Customer Relationship Management - is more than just a software application. It is a business solution for all customer-centric processes. 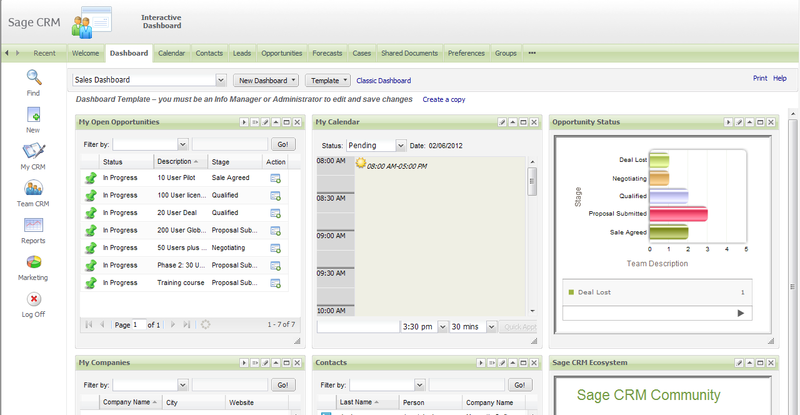 Sage CRM. Know your business. Grow your business. Sage CRM Sage CRM v7.1 Cloud sagecrm.com/trial Sage CRM provides your business with a complete view of prospect and customer interactions, enabling effective communication throughout the organization. Evolution of CRM. What is CRM? CRM at it s Core is. Sage CRM PC Retreat 2013. www.martinandassoc.com 1. Agenda. What is CRM? Why CRM? Newsletter Winter 201 2. Sage 50 Payroll RTI Edition. What will the new Sage Payroll RTI Edition deliver? Page 5. Focus on...crm. What is CRM?